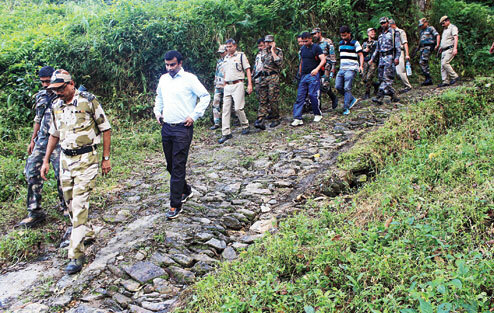 Two days after the gunfight between suspected supporters of Bimal Gurung and police killed sub-inspector Amitabha Malik on the banks of the Little Rangeet river, Vivek Chhetri retraces the path the cops had taken. The road is motorable only till a spot below the Barnesberg tea garden factory, about 20km from Darjeeling. Ten minutes into the walk, the last house stands. But the place where the camp was set up by alleged Gurung supporters is a 45-minute trek downhill - first through tea bushes and then through a narrow slippery pathway cutting through a forest. A bamboo hut covered with yellow polythene sheets is the first structure that meets the eye. A few metres away stands a dilapidated one-room wooden house. The room is strewn with clothes, a few utensils and even sleeping bags. There are four more bamboo structures along the river bank. A police officer recounted: "Caught by surprise, they ran in different directions. Since they knew the area well, the cadres waded through the river." A bullet allegedly fired from the other side of the river bank - a steep hill with dense outgrowth - seems to have hit Amitabha. The officer reportedly fell on the river. The banks appear to be separated by about 50 metres but the river is about 4ft deep with mild current. Wading through the river, one reaches a spot where a blue T-shirt and a pair of black trousers were found on Sunday. A 10-rupee and one-rupee note were placed on the trousers and a one-rupee note was found on the T-shirt. According to tradition in the hills, it is a custom to place currency notes on clothes during funeral. A Morcha leader had claimed there were no casualties on Gurung's side. The police had claimed they had seen some blood stains at this point on the day of the gun battle on Friday. Some other clothes were found strewn at the spot. A toothbrush, toothpaste and a half-empty Dettol bottle could also be seen. After a five-minute walk towards the right from a dilapidated house, one comes across a steep slope. The police had claimed that two cadres, one of whom was armed, were seen running in that area on Friday. "Our team intercepted them. One of our policemen and a youth fell down the slope almost 30 feet to the river bank," said a police officer. The police had claimed to have found arms behind rocks along the river bank.